Bright, bold and beautiful, this breathtaking centerpiece is sure to rake in some warm smiles. Perfect for Thanksgiving dinner. 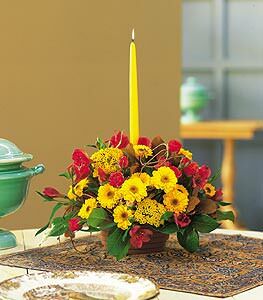 Alstroemeria, chrysanthemums and roses, along with a harvest yellow candle, are delivered in a tasteful dish.